Weekly reading & commentary – MDVL301(A): "THE LIBERAL ARTS"
In the main body of the course (weeks 4-11), set readings each week = around 50 pages. Some readings will be repeated, there are connections between liberal-art themed weeks, and these rereadings and intersections will accumulate over the seven weeks. 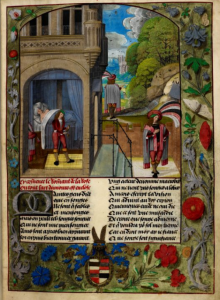 You should find that you have reread several parts of the Roman de la Rose several times—in different ways and resulting in multiple meanings—by the end of the course. You may also find yourself revising your previous readings, and comments thereon. This area, here, is the space for commentary. Apart fom this present post, everything in the “WEEKLY COMMENTARY” area is password-protected and accessible only to students in this course. I hope this enables free comment and the progressive building of a community of readers in our course. Welcome to the world of post-Medieval commentary. (1) Ask one simpler question, of the sort that you could answer yourself. Just compose the question: don’t answer it. (2) Ask one more difficult question, that would tax an expert or the author of the text in question. Similarly, just the question, not the answer. (3) Comment in response to your readings and our classes this week. —and pertaining to any aspect of or angle on the reading. These are your reactions to your reading, by you the individual reader and critic. NB: You are of course at liberty to write more, and more frequently, and to add further comments. Whether you prefer to wax eloquent or to be aphoristic is a matter of personal style. The above is the minimum required: simply make your weekly contributions, with at least some content–it needn’t be profound or stellar–and you’re guaranteed at least a B for this portion of the course. At the end of the course (week 13), I’ll ask you to choose what you consider to be your ten best posts. These will then become your portfolio = 10% of your final grade. – BUT: YOU MAY NOT BE ANONYMOUS! If you decide to be pseudonymous, please tell O’Brien what pseudonym(s) you are using so that she can attribute marks for comments accordingly. You may choose to reveal your online identity to your fellow-students (ex. in the Thursday discussions) or not: this is an individual matter. – write your two questions and comment in here. If this is your first comment on this blog, it might not appear straight away. Do not worry. It will once it’s been through moderation (= O’Brien), as will subsequent contributions. A similar process applies to comments made in response to previous comments. You are free to express any view, opinion, point of view, or belief; to hold or adopt any position; and to adhere to any school of thought. With few exceptions. Any view (especially if contentious, unusual, or indeed innovative) should be expressed clearly and coherently and supported by argument and/or proof. You should be prepared to uphold and defend your view/point of view. In the event of a discussion becoming heated: remember, you may agree to disagree. Some disputes cannot be resolved to the satisfaction of all parties. Some matters are irresolvable (by this kind of discussion, anyway). Some questions have no answers. If a view is contrary to fact—reality, historical facts (where known), material evidence (including the text at hand)—be prepared for this to be pointed out. Note: unlike real life and the law, however, ignorance is a defence (and is often expected: this is after all a course). Be polite, civil, and courteous. You are commenting on (texts and) comments, and arguing with arguments. Not with people. No personal attacks, accusations, insults, defamation, etc. Please refrain from making statements that are against Canadian and (as applicable) international law (incitement to violence, high treason, race hatred, genocide, etc.). If in doubt, exercise common sense. O’Brien reserves the right to step in to comment as needed.